Putting behind a checkered past by lending her skills to a greater cause, Jyn Erso is impetuous, defiant, and eager to bring the battle to the Empire. Used to operating alone, she finds higher purpose by taking on a desperate mission for the Rebel Alliance. Charge into battle like the Rebel Alliance soldier Jyn Erso from Star Wars Rogue One with this motorized blaster that fires glow-in-the-dark darts and features laser blast sound effects! This Star Wars Nerf blaster features GlowStrike technology that creates glowing light effects and charges the darts to make them glow when fired. The blaster’s acceleration button powers up the motor for motorized action and unleashes 6 darts in a row with clip-fed blasting. 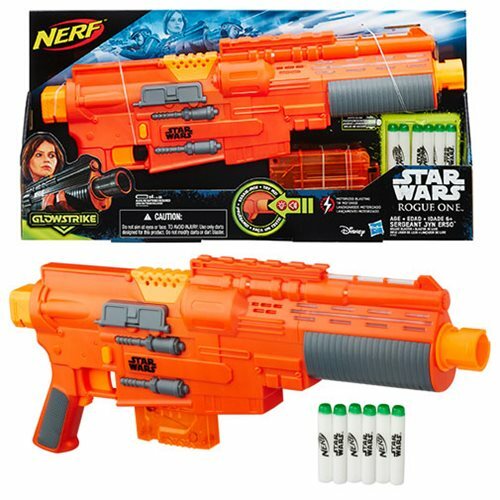 Illuminate Star Wars battles with the Star Wars Nerf Sergeant Jyn Erso Deluxe Blaster! Includes a 6-dart clip and 6 Elite GlowStrike darts. Measures approximately 19-inches long. Requires 4 "AA" batteries (demo batteries included). Ages 6 and up.